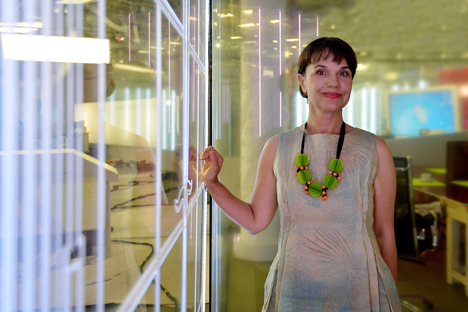 Marina Loshak, who replaced Irina Antonova, director of Pushkin Museum of Fine Arts for more than 50 years, talks to RBTH about museums and modern art. Much about Marina Loshak—her background, generation and vision—differs completely from those of her predecessor, Irina Antonova, who had steered the Pushkin Museum for more than half a century. Liberal-minded, with a wealth of experience in arts PR, she let this be felt almost immediately. “Even before I took up the position, the first thing I did was ask on Facebook: What needs to be changed? And people responded in a heartfelt way, with specific suggestions and analysis. This is what, in my opinion, the Pushkin Museum, just like other old-school museums, lacks—the feedback,” says Loshak. “Meanwhile, the museum is unique, with its educational program, a fantastic collection of replicas: Taken together, it is a wonderful installation, if somewhat too consistent. To make it more modern, of more immediate interest, we need to begin with some simple but definitive steps; to let people know we are waiting for them, we would like to be open, we are friendly, we are convenient. This is all very important for a contemporary museum,” says the new director. Loshak specializes in contemporary arts and the Russian avant-garde—which does not fit too naturally with her new position as director of an academic museum that houses a unique collection of Renaissance and 19th-century paintings. Then again, avant-garde art is not exactly new: It is roughly as old as the museum itself. “Contemporary art museums have an air of a laboratory about them, but we have a different kind of museum here. We should be talking art that has already proven its value objectively, artists who have already made history, whose works have already become museum heritage,” she says. “I like the method many contemporary curators have chosen of combining different techniques, linking history and arts together in a single stream. I admire Jean Hubert Martin—a wonderful curator who has been mixing old and modern art, letting them co-exist, come into contact and interact. It is incredibly effective; it gives the viewer a broad perspective, a whole world-view at once. The Pushkin Museum is a universal museum. It is unreasonable to fear unwanted surprises in a universal museum,” says Loshak. “On the surface, the museum definitely needs upgrading, in terms of storage and the building of electronic catalogues, which are still in their early stages. It lacks a virtual museum, as well as a number of the latest communications means. But it is essential to preserve the genius of the museum while altering its form— something Irina Antonova [now president of the Pushkin Museum], calls the ‘university genome,’” says Loshak. Shortly before Marina Loshak's appointment, the public was intrigued by a row between the Hermitage and the Pushkin Museum. The controversy arose around plans to re-open the currently defunct Museum of New Western Art, whose collection—selected Impressionist paintings—was split between the Pushkin Museum and the Hermitage. Irina Antonova moved to merge the two collections on the premises of her museum. The matter was finally settled, and Antonova’s motion was rejected. President Putin and Minister of Culture Medinsky issued a statement saying the Museum of New Western Art will never officially re-open and things will remain as they are. “Meanwhile,” says Loshak, “this is up to decision-makers responsible for state policies on cultural development strategy—the Ministry of Culture, the president, the prime minister. The museum community can only offer its expertise. Ever since Loshak’s appointment to director of the Pushkin Museum, the art world has been gripped by panic, amid rumors that the museum will fall into the hands of forces snatching control of the nation's cultural heritage—which is admittedly worth a lot of money.